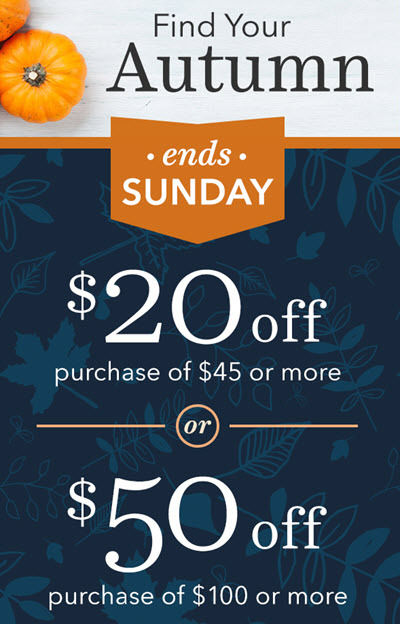 Find your Fall at Yankee Candle with $20 off a purchase of $45 or more OR $50 off $100 or more. Use promo code FALL18 to redeem online. Print or show the coupon on your phone to redeem in the store. Offer is valid through Sunday, 10/21. Pay for your purchase with a Yankee Candle digital gift card from your ShppingBoss account to earn up to 9% cash rewards. Did you know digital gift cards can be given as a gift? They sure can and you earn cash rewards! Simply print, email, or text it to your recipient.